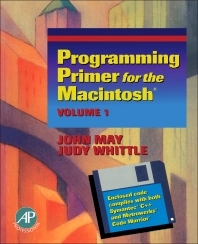 Programming Primer for the Macintosh, Volume 1 focuses on the principles and operations of the Macintosh system. The publication is a dependable reference for computer programmers and researchers interested in the Macintosh system. John May is the Group Leader for Computer Science in the Center for Applied Scientific Computing (CASC) at the Lawrence Livermore National Laboratory. His interests include parallel programming models, performance analysis, parallel I/O, and parallel programming tools. He has served on the MPI-2 Forum, the High Performance Debugger Forum, and the Steering Committee of the Parallel Tools Consortium. Currently, he works on the Parallel Performance Improvement project, where he is investigating performance analysis techniques for massively parallel computers. Dr. May joined LLNL in 1994 after receiving his Ph.D. in Computer Science from the University of California, San Diego. He also holds a BA in Physics from Dartmouth College. Prior to entering graduate school, he worked at AT&T (now Lucent) Bell Laboratories on optoelectronic device technology.